On the occasion of the release of his new album on Deutsche Grammophon, "If On A Winter's Night...", the songwriter and singer Sting will give an exceptional concert and perform on stage of Salle Pleyel (Paris), Wednesday December 15th. 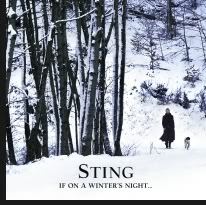 The program encompasses winter songs - Sting's favourite season - and will be arranged as a musical and enchanting "winter journey" with traditional music of the British Isles as a starting point. For the purpose of this unique concert in France Sting returns to his roots and revisits his native region of Newcastle. He will be joined by his friend and long time colleague, guitarist Dominic Miller. Additional guests include an ensemble of remarkable musicians (strings, brass, percussion, Northumbrian pipes, melodeon, a metal string Scottish harp and of course vocals (soloist and ensemble). In collaboration with esteemed producer and arranger, Robert Sadin, Sting and his guest musicians will perform a vibrant collection of songs, inspired by traditional themes of Scotland and the North of England: Christmas songs, lullabies, including "The Snow it Melts the Soonest" (traditional Newcastle ballad), "Soul Cake" (traditional English "begging"-song), "Gabriel's Message" (14th century carol), "Balulalow" (lullaby written by Peter Warlock) and "Now Winter Comes Slowly" (Henry Purcell). Several of STINGs own original compositions - two of which are featured on the album ("Lullaby for an Anxious Child" and "The Hounds of Winter") will be performed, as well as a musical reworking and English translation (by StingG ) of "Der Leiermann (Hurdy Gurdy Man)", part of Schubert's famous winter-song-cycle "Die Winterreise". Inspired by the rich winter theme - a season which has enthused countless musicians over the centuries - Sting and his guest musicians will present an arc of new songs, conjuring the season of ghosts and spirits, and will drag the public into a reflective musical journey full of mystery, penetrating beauty and poignancy.